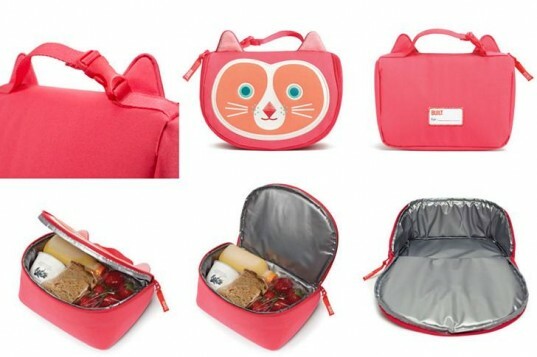 Just in time for back-to-school and packed lunches, Built NY debuts an adorable new collection, Big Apple Buddies that offers fun Kids Lunch Bags and Kids Sandwich Bags in wonderful colors and designs. Get rid of plastic baggies for good, cut down on waste, and make lunch time oh so much more cute with these sweet baggies and lunch sacks. These too-sweet kids lunch bags from Built NY are the perfect way to perk up your child’s lunch and keep food and drinks cool. This is also the perfect bag for snacks on-the-go, while heading to daycare or a picnic playdates. Each insulated lunch tote fits a sandwich, fruit or veggies, an organic juice box and a small ice pack. The interior can be easily wiped clean and its sturdy construction holds up to wear and tear. Each bag features a small, write-on nametag to help distinguish the bag from other lunch totes – good for siblings who want the same bag. A kid-friendly handle with a buckle that unsnaps and attaches to backpacks, book bags, or strollers is included, along with a soft zipper pull that’s easy for small hands to open and close. Busy kids on the go can snack in style with these adorable new sandwich bags. Great for daycare, school, day camp, play dates or just around the house, each of these reusable bags help cut down on waste and save you money, by eliminating hundred of plastic bags each year. 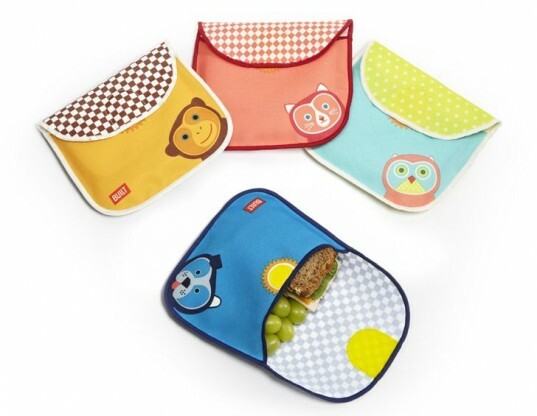 These smaller snack bags are perfectly sized for smaller appetites and food stays safe under the secure Velcro wrap. You won’t believe it, but these useful bags are also dishwasher safe! You can’t beat that. All of the sandwich baggies coordinate wonderfully with the Lunch Bags shown above. These Built NY reusable lunch and snack time bags are tested for lead safety and phthalates and meets or exceeds ASTM and applicable safety standards. The bags are also made with food-safe materials and are PVC, BPA, latex and vinyl-free. Safe for kids 3 years+. These too-sweet kids lunch bags are the perfect way to perk up your child's lunch and keep food and drinks cool. This is also the perfect bag for snacks on-the-go, while heading to daycare or a picnic playdates. Each insulated lunch tote fits a sandwich, fruit or veggies, an organic juice box and a small ice pack. The interior can be easily wiped clean and its sturdy construction holds up to wear and tear. Each bag features a small, write-on nametag to help distinguish the bag from other lunch totes - good for siblings who want the same bag. A kid-friendly handle with a buckle that unsnaps and attaches to backpacks, book bags, or strollers is included, along with a soft zipper pull that's easy for small hands to open and close. Busy kids on the go can snack in style with these adorable new sandwich bags. Great for daycare, school, day camp, play dates or just around the house, each of these reusable bags help cut down on waste and save you money, by eliminating hundred of plastic bags each year. These smaller snack bags are perfectly sized for smaller appetites and food stays safe under the secure Velcro wrap. You won't believe it, but these useful bags are also dishwasher safe! You can't beat that. All of the sandwich baggies coordinate wonderfully with the Lunch Bags shown above. These reusable lunch and snack time bags are tested for lead safety and phthalates and meets or exceeds ASTM and applicable safety standards. The bags are also made with food-safe materials and are PVC, BPA, latex and vinyl-free. Safe for kids 3 years+.